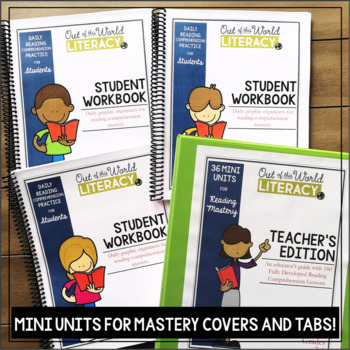 This free organizational resource will help you get ready to teach reading comprehension with the Mini Units for Mastery! 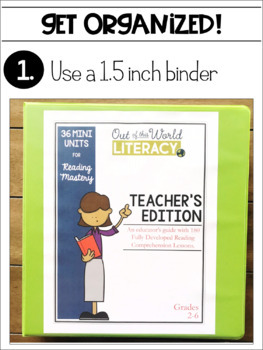 Download this resource to see awesome organizational ideas that will help you create teacher's editions, as well as student workbooks for the Mini Units for Mastery. ***To see the THE MEGA BUNDLE with ALL 36 MINI UNITS FOR MASTERYCLICK THIS LINK HERE. ***To see the THE SECOND MINI UNITS BUNDLECLICK THIS LINK HERE. **** To see INDIVIDUAL SETS of Mini Units for Mastery BUNDLES CLICK THIS LINK HERE. ***Use these LITERACY CENTER ACTIVITIES in correlation with the mini units and CLICK THIS LINK HERE. 1. 5 mini lesson statements and detailed teaching instructions for teaching about 12 specific reading comprehension skills. 2. 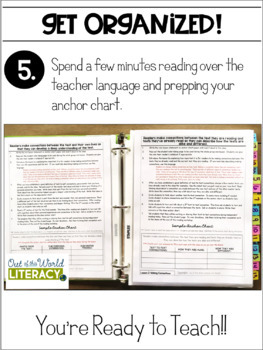 5 sample mini lesson anchor charts for each skill (your anchor charts will look different based on the mentor texts you choose to use and the responses from your students, but you can use the same outline as provided). 3. ‘I Can’ statement cards for each lesson in the units. These are great to post in the room, at a literacy station, glued into readers’ notebooks, or posted at a small group table. 4. Blank anchor chart pages for students with every lesson. 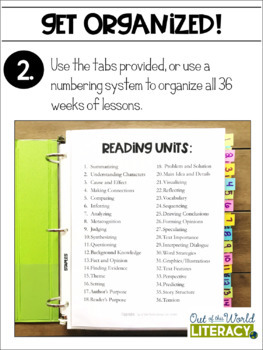 These can be glued into reader’s notebooks in a mini lesson section. Students can complete them during the lesson and have a record of learning kept safely in their notebooks to reference anytime! 5. 5 graphic organizers for independent activities that match each of the 5 mini lessons in each set. These can be used with any text students are reading and can be used over and over again. They are great for assessment! 6. Short comprehension quizzes for each unit to administer after the 5 lessons are completed. Answer keys are provided! 7. A certificate of mastery you can give students to build their confidence for each set! 8. 14 different styles of brag tags for rewarding students for all their hard work and learning. These brag tags are available for students to collect for each skill!